My experience of switching to Verizon FiOS from Comcast. Just a few weeks back, I was picking up my kids from school when I noticed Verizon FiOS trucks on our street. Sure enough, Verizon was upgrading our area to offer FiOS service in our neighborhood... and after 6 months of being a customer, I decided it was finally time to write a review. Overall this bundle is a great starting point for a family looking to get FiOS internet and TV at a price that won't break the bank. Unlimited calling on your home phone. This bundle is the ideal choice for families looking to save money on FiOS and still have a home phone. 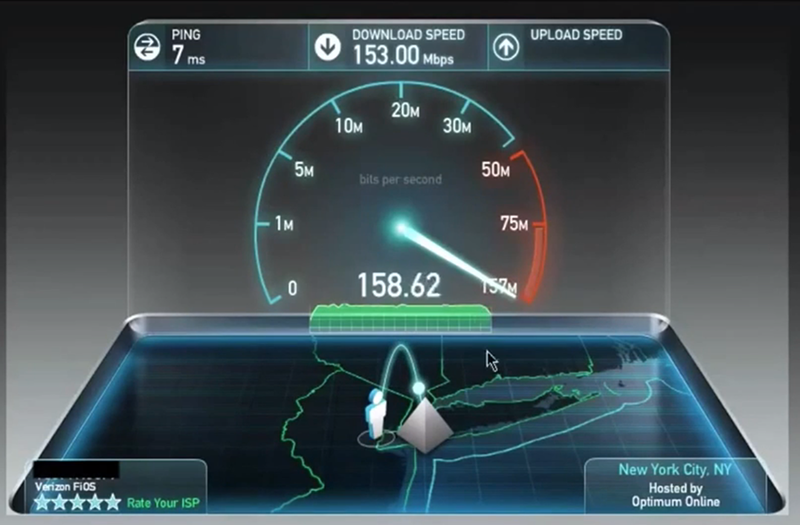 It's no secret that FiOS is known for it's blazing fast internet but until you experience the speed it's hard to understand how much it improves you internet experience. Within 3 days, the tech had come out to install the service and in no time he had our home network setup and ready to go. Here is a screenshot of our speedtest. Phwam -- The internet is now super fast. While, most people obsess over download and upload speeds, the real beauty of having a fiber internet connection is the "ping" or the speed at which your connection is able to send and receive requests. Before switching to FiOS from Xfinity, my ping was always around 80ms, or roughly 10x slower than my connection with FiOS. ... and for the adults in the house, this means there is a super short delay in each page loading as compared to the common white screen most people see between pages loading. Before we used to spend a few seconds waiting for our page to load, now it's faster than we can blink. Overall, I'd rate FiOS Internet at a 5 out of 5. Overall, FiOS TV includes everything you'd expect when shopping for TV. They've got several different plans, services, and premium channel packages. Since our family mainly watches content online such as Netflix and Hulu, we went with the basic TV package and it meets our needs just fine. If you are planning on getting an HD package such as FiOS Quantum or one with a lot of channels and DVRs, make sure to factor each DVR or cable box into your overall price because those fees can sneak up on you. It's no secret customer support from broadband companies is notoriously bad, but that said, so far my experience with Verizon hasn't been horrible. Sure, it hasn't be great, but overall their customer service is as good as, if not better than that I experienced with Comcast's Xfinity. About 3 months after getting our service installed, our internet went out one evening. After calling in and waiting 15 minutes to get through to a customer service representative (she was US based that is the good part) the company sent out a tech the next day and got our service back up and running for no additional charge. FiOS Reliability — It works when you need it to. One of the things I like best about FiOS is how it's how it works without us having to worry about it. Before we switched from Comcast (they were the only provider in our area before FiOS), we thought more people had issues with their internet service going out once or twice a month. Since switching to FiOS, we've had reliably good service with only 1 outage that we've noticed. Overall this one element of FiOS, this has completely changed our perspective on what to expect when shopping for internet service. In my research on writing this review, I stumbled across an entertaining and interesting look at how FiOS is actually managed and run. It's worth a watch if you want to see the behind the scenes of how FiOS works. In short, if FiOS is available in your area, I can't urge you enough to just bite the bullet and sign up for their service. Sure, their sign up process can be a bit confusing and figuring out the current FiOS deals can be confusing too... but once you navigate this maze their service is nothing short of amazing. While I've tried to keep this review as short and sweet as possible, I am a programmer by trade so I have a unique perspective on this. That said, if you have any questions, feel free to drop them into the comments below and I'll be happy to answer them the best I can.